After having many years of dealing with Uranium Exploration on our Property, we feel we know more about Uranium than miners know about farming. fashion dust that is stirred up every time a vehicle passes by, caused lower yields in our wool, therefore devalued it. Lowered our returns. 3* If it is as we are told very safe, why then is it not possible to store it in Adelaide? Lots of land there close to the sea not being used. Plenty of workers going to be needing jobs soon in Adelaide. This is the only State not allowed to grow GM crops, because it could contaminate other crops (see court cases in WA etc;) and the stigma attached to GM, which upsets our Politicians. So what would South Australians and the rest of the world think is worse? The answer is obvious. 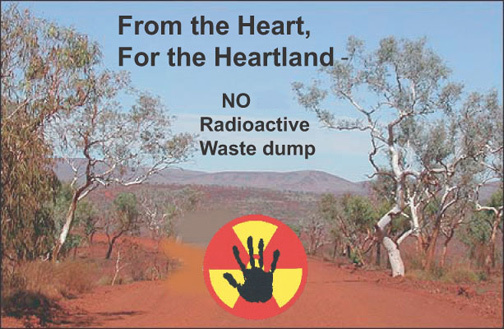 If in the polls or Royal Commission were to ask the South Australian people in their individual areas eg; (5th East, Riverland, Adelaide etc/) did they want a Uranium waste dump, we are sure the answer would be NO, not in our back yard. place for URANIUM, is LEAVE IT IN THE GROUND. 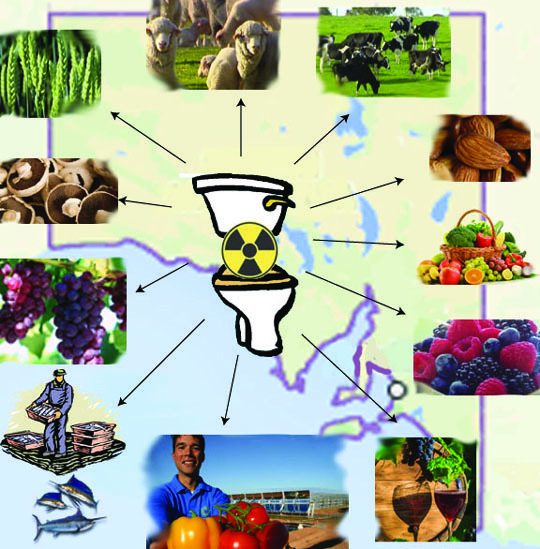 Nuclear Commission’s recommendations – a poisoned chalice for South Australia? As a South Australian citizen, I am very concerned by what appears to be a disregard for the rule of law. This is particularly concerning as the nuclear industry across the world has a somewhat tarnished reputation when it comes to transparency and compliance with legal requirements. Any lack of confidence in the rule of law (whether perceived or real) will be extremely detrimental to this project and to South Australia as a democratic state. A high level nuclear waste dump is a permanent solution to a temporary problem. Voluntary importation of one of the deadliest substances known to humanity, with all of its intransigent problems (which no country in the world has yet managed to resolve) may indeed prove to be a poisoned chalice. Indeed, the x billions anticipated as revenue are minor in global economic terms, and definitely insignificant given the 240,000 year time frame of the proposal. Overview The subject of Nuclear Fuel production has been a matter of National discussion and investigation for the past 60 years in Australia. The people of this country have emphatically rejected the development of Nuclear Fuel production, from every stage of mining, milling, fuel fabrication and power generation, to any involvement in the proliferation of nuclear weapons in the world. 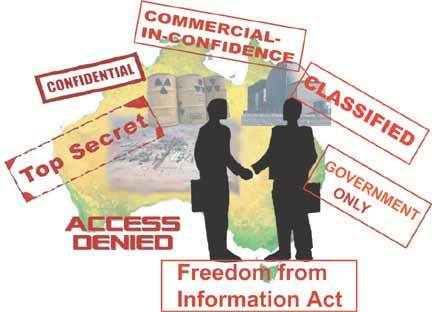 The Nuclear Power proponents, have at every stage despite persistant resistance, continued to force the Australian Public to defend the non-nuclear position. Here, we find ourselves again defending the right of our country to remain as Nuclear-Free as possible, considering we have already be encumbered with the legacy of numbers of Uranium Mines past and present, for a clean future in Australia. These are serious issues which the Public does not take lightly. It is plain to see from these “Tentative Findings” that minimal consideration has been given to the concerns and objections raised in a range of submissions received. The subject matter which the Commission has been charged to investigate, has been studied in a less than thorough or in depth manner. The following comments are responses based on first- hand knowledge of the actions of the Nuclear Industry in South Australia as was my Submission. My major concerns are:  if Australia takes HLW from other parts of the world, that HLW will continue to be produced and that a safe answer to its disposal will be postponed by another 60 years or never be adequately addressed.  That the money to be spent over the 11-15 years to set up the repository, would be better spent on becoming leaders in the renewable boom that is taking place Worldwide.  That the eventual cost will fall in the taxpayers’ laps when/if an unforeseen incident occurs. CONTAINERS:  Both Finland and Sweden have been unable to arrest corrosion of containers to be buried in the deep geological repositories. The storage and disposal of used nuclear fuel in South Australia is likely to deliver substantial economic benefits to the South Australian community. An integrated storage and disposal facility would be commercially viable and the storage facility could be operational in the late 2020s. The Tentative Finding summarised above is given in more detail in Findings 81- 94 on pp.17-20. These findings appear to be based to a large degree upon a report by Jacobs MCM (2016) that had not been available for public scrutiny until February 2016, around the time of the release of the Commission’s Tentative Findings. The following comments examine critically some of the assumptions underlying the Tentative Findings and Jacobs MCM (2016), especially the latter’s Paper 5. They also discuss the financial risks of the proposed project. The comments focus on the storage and management of high and intermediate level wastes. The proposal is that we should accept waste before the repository has been completely built and tested. This proposal is so reckless, as to be negligent. We would face the very real risk of being left with high-level nuclear waste, and no technology to properly handle it. The plan [outlined in The Nuclear Fuel Cycle Royal Commission’s Tentative Findings] seems extraordinary. It is proposed that we should give ourselves a waste problem in the hope that we, unlike everyone else, could solve it – like a person who takes up smoking just to prove they can quit. I argue that this finding is open to challenge on technical, and economic grounds. I point out that no country has yet successfully operated a permanent high-level nuclear waste storage facility, without incident, for any substantial length of time. This includes technologically advanced nuclear nations, such as the USA, and Russia. These countries have been generating nuclear waste for over fifty years and yet they have still not solved the waste storage problem. It is stretching credibility to the limit to imagine that a non-nuclear country, like Australia, could succeed where the USA and Russia have failed. No country has ever operated a high-level nuclear waste storage facility, as a commercial enterprise. It is doubtful that anybody ever will, because the service is impossible to price. No markets exist for this type of service. ……. EXPLORATION, EXTRACTION & MILLING “………I have previously expressed my criticism that this, and indeed all Royal Commissions conducted in South Australia are exempt from the Freedom of Information Act 1991. This is fundamentally undemocratic, and contradicts claims made by the Commissioner on many occasions of his commitment to openness and transparency. They are found in the results of Radium Hill worker cohort studies published in peer-reviewed medical journals. The epidemiological studies of the 1980s, published circa 1990 proved, with epidemiological evidence of elevated cancer incidence, that confidence expressed in the safety of working conditions at the Radium Hill mine in the 1950s and 1960s was ill-founded. It is extraordinary that the South Australian Nuclear Fuel Chain Royal Commission is not publishing Responses to its “Tentative Findings” before it makes its final announcement on May 6th. Meanwhile, here is part of at least one very clear and informative response. NUCLEAR FUEL CYCLE ROYAL COMMISSION TENTATIVE FINDINGS RESPONSE March 2016 Dan Monceaux – Documentary filmmaker & South Australian citizen. “…… I sincerely hope that the health and wellbeing of South Australia’s workforce, its citizenry and its environment are considered sufficiently important topics for this Commission to elaborate on the matters raised here ahead of its final report to Parliament in May. I wish to make a case for the prioritisation of epidemiological studies of past and present South Australian uranium worker cohorts as a matter of the utmost importance. 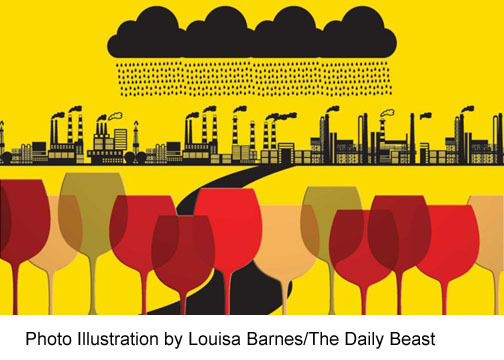 The results of such studies could provide an empirical basis for future commentary regarding the safety or otherwise of the industry as it has existed until now……. 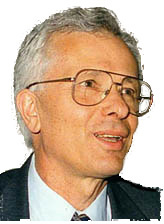 The Commission states that “policies must be based on evidence, not opinion or emotion.” The same rule should apply to statements made by the Commission. To be considered credible, they must be supported by material evidence. The absence of evidence is not evidence of absence. Harm can neither be proven, nor safety assured without relevant epidemiological studies. This was known to South Australia’s Department of Mines in 1956, when Dr. B. S. Hanson wrote in The Health of Workers in the Uranium Industry (pg. 16): “It is only by long-term health examinations that the validity of our present speculative exposure limits may be tested.” This document is currently available on SARIG, the South Australian government’s resources industry geoserver: https://sarigbasis.pir.sa.gov.au/WebtopEw/ws/samref/sarig1/image/DDD/RB4200080.pdf……. As the days get a bit closer to #NuclearCommissionSAust’s announcement of its (predetermined) findings, we need to remember that the Commission’s “Issues Papers” almost completely ignored the question of the dangers of transporting highly radioactive trash across land and sea. The Royal Commission apparently assumes that the movements of many hundreds of thousands of tonnes of spent nuclear fuel from many countries around the world to the Gawler Craton will be low risk, no problems and perfectly safe. As contradictory as those stances are. I do not accept that position of default safety. Further I do not accept that the unloading of the HLNW will be perfectly safe. I do not accept that road transport from port to repository site will be perfectly safe, even on a dedicated purpose built road. This is the first of the significant posts that will appear on this site each day, ,until 6th May. The Greens SA’s submission to the Nuclear Royal Commission’s Tentative Findings rejects the suggestion that an economic bonanza awaits our State if South Australians would only resign ourselves to becoming the world’s nuclear garbage bin. “The Royal Commission has been blinded by imaginary wealth and sucked into believing that a project that has never succeeded anywhere else in the World is South Australia’s for the taking”, said Greens SA Parliamentary Leader, Mark Parnell MLC. “The most obvious question is being ignored: If this is such a great deal, how come no other country has grabbed it before now? “The Greens are urging the Royal Commission to “get real” and critically examine the supposed economic benefits alongside the ongoing economic, social, environmental and reputational costs. “Washing your hands of responsibility for a toxic legacy left to future generations is just immoral. “The solution to South Australia’s current unemployment problems won’t be solved with mythical jobs that are decades into the future with the creation of toxic liabilities that last hundreds of thousands of year. On releasing the “Tentative Findings” Report to the media on 15th February 2016, Commissioner Kevin Scarce stated, “The community needs to understand the risks and the benefits.” The Royal Commission’s “Tentative Findings” highlights many purported benefits but is scant on detail when it comes to the profound risks. 7.Naïve expectations that South Australia would get to keep all the profits from a nuclear waste dump in our State, without having to share them with other States. “The Commission’s final report due on 6th May should recommend that the folly of South Australia’s increased involvement in the nuclear industry be abandoned. “In relation to the other Terms of Reference, increased uranium mining, uranium processing or nuclear power were never really an option for SA and the Royal Commission was an expensive way to tell us what we already knew”, concluded Mark Parnell.